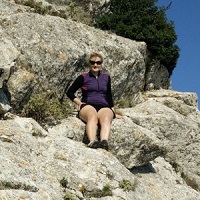 This entry was posted in Hiking Clothing Recommended Products Women’s Hiking Base Layers and tagged backpacking gear hiking gear icebreaker kari traa merino top merino wool minus33 smartwool woolx on February 24, 2019 by Laura P.
A base layer top is worn directly over your sports bra and should thus feel comfortable against the skin and be breathable, moisture-wicking and quick-drying. A base layer should feel comfortable against the skin and be breathable, moisture-wicking and quick-drying. Base layers can both be made of natural and synthetic fabrics as well as blends of these, but Merino wool stands out among all these materials (to learn more, read Comparison of base layer materials). Besides fulfilling the criteria above, Merino wool has unique antimicrobial properties due to its natural content of fatty acids (namely lanolin) which means that it inhibits the growth of bacteria which would otherwise make your sweat (and thus clothes) smell bad. This makes Merino wool garments the perfect choice for longer hiking trips where you might go days without possibility for washing your clothes. Furthermore, Merino wool also keeps you warm even when wet (read why in our in-depth article Why you should wear Merino wool clothing); If you are planning to use your Merino top as a stand-alone piece in warmer weather, you might be happy to know that the material naturally absorbs radiation throughout the entire UV-spectrum and thus provides protection against the sun’s damaging UV-rays. For those who have never felt the sensation of a high-quality Merino wool fabric, it must be noted that it is nothing like wearing an old-school Ragg wool garment. Merino wool is known for being non-itchy and comfortable to wear, having a surface a bit like brushed cotton. Who knows – you might get so addicted to the comfortable feeling of Merino wool that you will wear your base layer day in and day out – whether in the city or on the trails. Below we have chosen five different brands which make superb Merino wool base layer tops and our respective favorites within each line to help you getting orientated about the options currently available. 1. 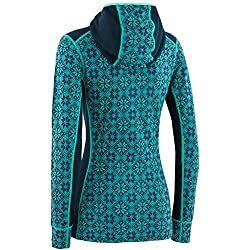 Buying a Merino Base Layer – What is important? Merino wool can be knitted together more or less densely, resulting in fabrics weighing from 135 g to 400 g per square meter. The lighter the fabric density, the more breathable, lightweight and quick-drying the base layer will be. However, it will also be less able to reduce your body’s conductive heat loss and thus less warm. Base layers made of Merino wool with a density of 150 g/m2 or less can be used efficiently in warm weather and thus deflate the myth that wool is only for use in winter. However, heavier densities are mainly for use in fall, winter and spring where the base layer has to keep you warm above all. Base layers with fabric densities above 250 g/m2 are generally considered inefficient for sports use as they are quite heavy and take too long to dry when soaked with sweat. 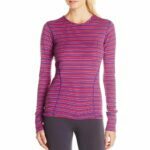 When buying a merino base layer, you should therefore consider which seasons and activities you intend to use it for and select a product with an appropriate fabric density accordingly. A base layer goes directly on your skin and seams therefore need to feel comfortable – or not be “felt” at all. You can achieve this by choosing garments sewn together with flatlock stitching, which is also stretchy and durable. 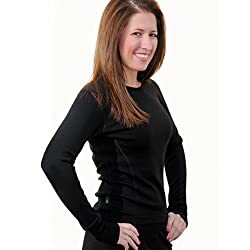 A tight-fitting base layer reduces heat loss and thus provides a little extra warmth, which is great for cold conditions, while a more loose-fitting garment will allow ventilation, which is a plus in warmer weather. Depending on your intensions, consider to size up or down – again keeping the fabric density of the respective base layer in mind. 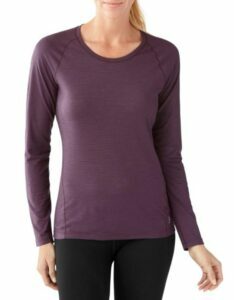 Tight-fitting base layers are easier to layer on top of, but thin loose-fitting Merino tops shouldn’t cause too much hassle either. Merino wool naturally protects against UV-rays and Merino base layers can therefore be categorized as sun-protective clothing. The level of UV-protection is rated as UPF (Ultraviolet Protection Factor) which indicates how many percentages of UV-rays penetrate through the fabric; a UPF of 30 and 50 means that 1/30 (≈3.3 %) and 1/50 (≈ 2 %) of UV-radiation enters through the fabric respectively. The UPF is not only dependent on the fiber type (Merino, polyester, cotton etc.) itself, but also on factors such as construction, amount of stretch, dyes, treatments and condition of the garment (brand-new or worn-out), so it is hard to assess it on your own and manufacturers do not always disclose it. For Merino base layers, you can usually count on a UPF of at least 25, but some offer protection up to UPF50. To learn more about the various UPF-rating factors, read the article Sun Protective Clothing for Hiking. 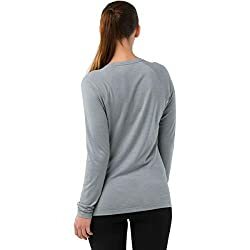 All the Merino wool base layers listed below can be washed at low temperatures in the machine and some of them can even be tumble-dried gently. Minus33 operates with four different categories of fabric density within their range of Merino apparel; micro-weight (150g/m2), light-weight (170g/m2), mid-weight (230 g/m2) and expedition weight (380-400g/m2). Within each category you will find a long-sleeved ¼zip model and a crew-neck model. 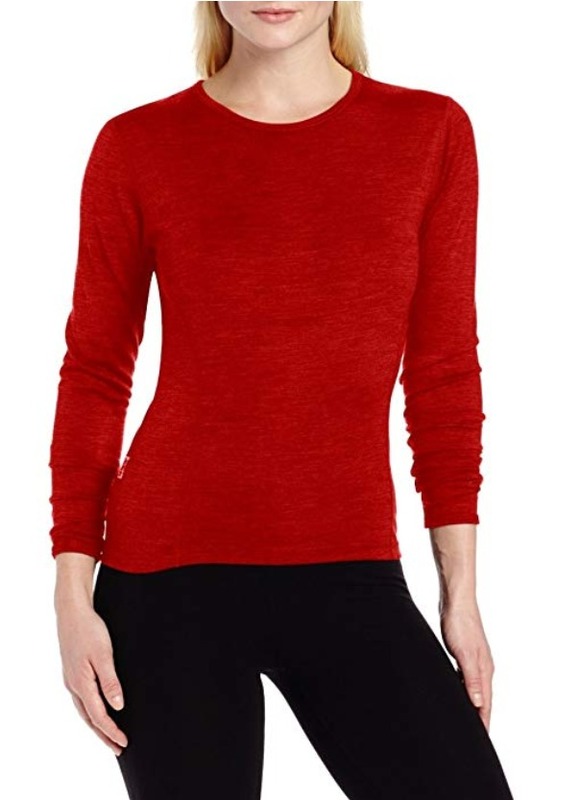 The Minus33 Moriah is the long-sleeved crew-neck within the brand’s light-weight Merino base layers which also includes short-sleeved t-shirts. It is made of 100% ultra-fine 17.5 micron Australian Merino wool and has a UPF-rating of 25. The Minus33 Moriah comes in three dark colors and can be used all year round except for the very warmest of summer days. 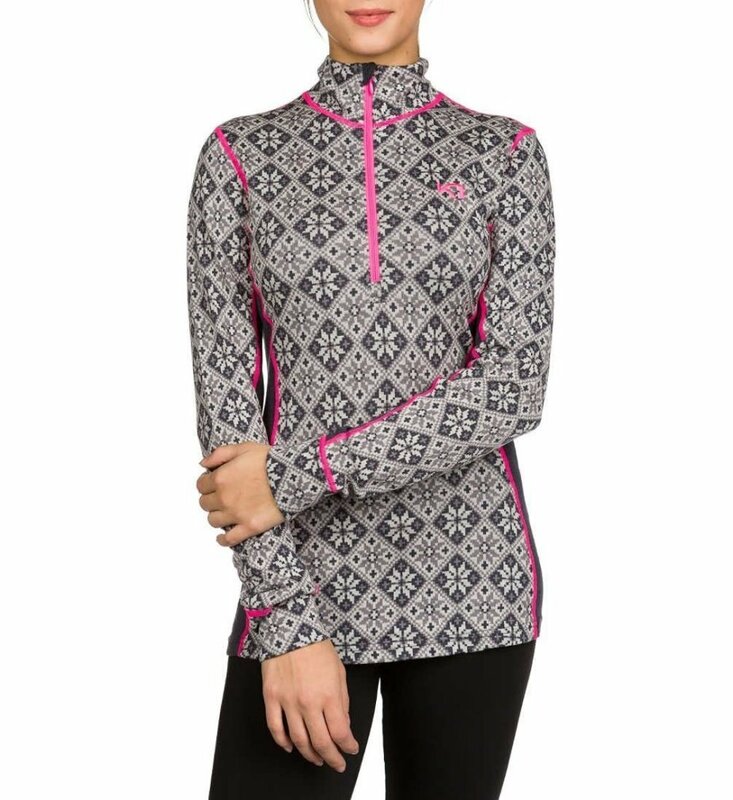 The NTS Micro 150 tops from Smartwool can be used on their own in warm weather or as base layers in colder conditions as they are made of 100% lightweight Merino wool with a density of just 150 g/m2. Smartwool also has the NTS Mid 250 line which is a mid-weight range of base layers (fabric density of 250 g/m2), but for this review we chose the lightweight line as the thinner fabric used offers more versatility. The Smartwool NTS Micro 150 top comes with a crew neckline or hood as well as in a button-up version with 3/4 sleeves. Smartwool does not disclose the coarseness of the Merino fibers used, but users report it to be super soft. 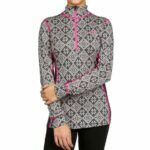 The garment is sewn together with smooth flatlock seams; in the sides it has been constructed so that the seams wrap to the front for a more flattering fit. Lightweight Merino fabric makes it suitable for use in warm weather as well. The Norwegian brand Kari Traa has been a favorite in Europe and Scandinavia for almost a decade, but only in 2015 did it enter the US market and is thus still relatively unknown. Kari Traa offers multiple high-performance base layers in Merino wool with an emphasis on bright colors and flattering fit without sacrificing functionality. The Kari Traa Rose top is a great example of this as it mixes 4-way stretch Merino wool of two different densities in a streamlined design where the main part of the top is made of mid-weight Merino (240g/m2) to keep you warm, while the sides and underarm area are made out of a much lighter Merino wool (180g/m2) to provide ventilation where you need it the most. 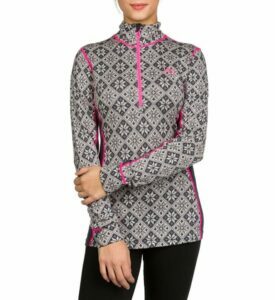 The Kari Traa Rose top is available in three different models which all allow enhanced ventilation; a button up version and two half-zip models – with or without a hood. Uses Merino wool of varying densities to ensure both warmth and ventilation. Icebreaker is the pioneering brand when it comes to Merino wool for hiking clothing and thus it is no surprise that it offers several high-quality base layers in both 100% Merino wool as well as blends with synthetic materials for increased durability. 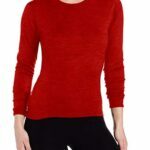 If you are looking for a base layer that you can use in all seasons, you might consider the long-sleeved Sprite or Siren Sweetheart tops which consist of 150 g/m2 Merino wool mixed with 12% nylon and 5% Lycra. For base layers made of 100 % Merino wool, you should look to the Oasis models which are made of Merino with a density of 200 g/m2. 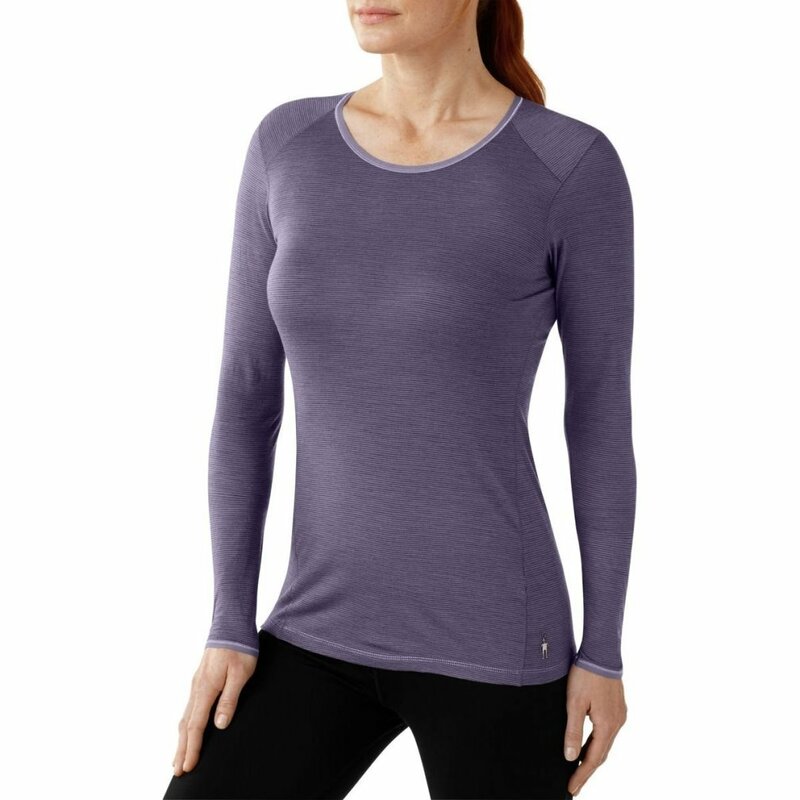 Icebreaker Oasis is available in multiple stylish colors and discreet patterns and with a half-zip, v-neck or crew neck line. Woolx offers several great midweight Merino baselayers – all using 100 % Australian Merino wool with a fabric density of 230 g/m2, which make them suitable for use in colder weather. 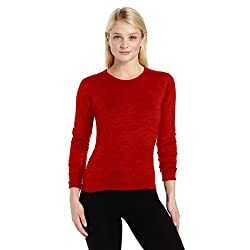 The midweight models include the Woolx Hannah with a crew neckline, the slightly longer Eva tunic, the Peyton turtleneck and the Brooke half-zip version. For this list we had to go with the classic Hannah model as it features flattering princess seams in the front and comes in several colors. Other becoming details include the three inch cuffs on the sleeves, underarm gussets, a tagless construction and the slightly dropped back hem.